The modern commemorative coin era began with the release of the 1982 George Washington Half Dollar. Since then, the United States Mint has continued to release a steady stream of commemorative issues in various denominations. Many different subjects have been featured, from former Presidents to the Olympic Games. Since the coins are produced for collectors and not for circulation, quality control is generally strict, resulting in very few known errors and varieties. One of the few known is the 1989-D Congress Bicentennial Silver Dollar with a rotated reverse die. The commemorative program consisted of a clad half dollar, a silver dollar, and a $5 gold piece, all of which were struck in both uncirculated and proof format. Honoring the bicentennial of American Congress, the issue was authorized in 1988 to be struck the following year. It was expected that demand would be high and a large number of each were authorized, including three million silver dollars. Total sales, however, were much lower, with 135,203 uncirculated silver dollars sold, plus 762,198 Proofs. A rotated reverse die error can be caused by a number of different reasons, but first a little bit on the orientation of dies. When a coin is struck the obverse and reverse dies can be placed in a variety of different ways, depending on what is custom in the country the coin is struck. In earlier times most coins were struck without much attention to the orientation of the dies relative to each other. This can be seen on many medieval coins, which come with different orientations. What we mean by that is that when such a coin is tipped over horizontally (→) the orientation of the other side can be upside down, right side up, or anything in between. Eventually two different orientations (or turns) became customary: coin turn and medal turn. Coin turn means that when a coin is flipped horizontally, the other side will be upside down (↑↓). This is the orientation that is usually found on United States coins. Other countries, such as those in the Eurozone using the Euro, have a medal turn, which means that when the coin is flipped horizontally, the other side will still be right side up (↑↑). A mistake can be made when a die is inserted, resulting in a 45 degree turn, 90 degrees, or even 180 degree turns produced in error. Generally, the latter are the most valuable and popular because of the easiness of seeing the difference. Many collectors consider a medal turn on a coin to an interesting and appealing mint mistake. 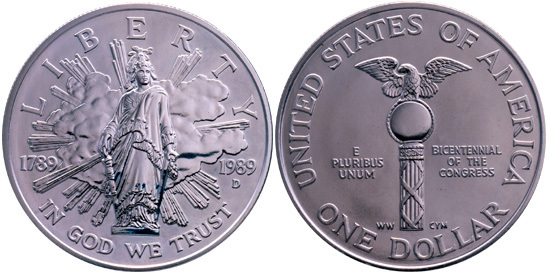 Some examples of the 1989-D Congress Silver Dollar are found with such a rotated reverse error, with a rotation of the reverse die of almost 180 degrees. When flipped over horizontally, the reverse die is almost perfectly lined up as if it were struck with a medal turn. Why and how this happened is unknown, but since no commemorative silver dollars are known with intermediate turns, it can be reasonably expected that one of the dies was inserted incorrectly by an employee of the Denver Mint. If, for example, the die was loose and gradually turned, there would be commemorative silver dollars found with intermediate rotations of the reverse die. Because quality control of commemorative coins is much stricter than that of regular coins intended for circulation, such errors are rare, and of the 1989-D Congressional Silver Dollar, fewer than 100 examples are known to exist. This indicates that the error was discovered relatively soon, but that due to unknown circumstances a few managed to enter the market. Because the error is relatively unknown, it is likely that at least a few remain undiscovered in the original US Mint packaging. The 1989-D Congress Silver Dollar is a prime example of a modern error coin that is easy to observe but difficult to find. It is a coin that is common enough that most coin shops will carry them, making cherry picking still possible. Don’t forget, however, that this error is rare for a reason, which makes finding an unattributed example a fortuitous but unlikely occurrence. I found a 2011 American Eagle reverse Proof in MS 69 graded by NGC that HAS slight reverse Rotation on the reverse side of the Coin. Aretheir any other known to Exist.